The hostel is very good. The costumers was pretty fine and the atmosphere is friendly. The price is really ok for what the hostel offer! Nice place ! Great location, but the room doesn't have enough power plugs, and the roommate didn't let us use the bathroom!! Really good hostel with great staffs!! O hostel tem uma ótima localização (colado no metro é razoavelmente perto do centro), as instalações são confortáveis, mas o staff é muito fraco, não sabem dar dicas da cidade, não resolvem problemas (fui acordada no meio da madrugada pois meu quarto deu overbooking), o ambiente não é muito animado/carismático. Among the hostels I have stayed this was the worst. The physical structure is good, similar to a hotel, however the staff seem not to care about their well being. The internet does not work at all and besides for 2 nights I heard parties in the next room, with noises and people knocking on the door. The kitchen is very small, dirty and poorly equipped. Localização boa, poucos metros de uma estação de metrô, staff agradável. Porém o lugar é sujo! Tanto as áreas comuns quanto o quarto em que fiquei eram sujos. 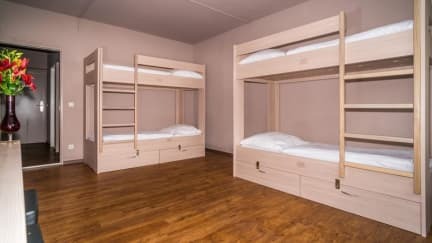 Não tem tomadas suficientes para a quantidade de camas no dormitório. The bed had bed bugs. I have bruises All over my body. Besides that, i sent an e-mail 2 weeks before because i needed to cancel the last night, and then never answered me. when i arrived there, i tried to explano that i had a problem with the reservation and needed to cancel the last night and the staff told that the manager wasnt working, so there was nothing then could do, and then called the next person to check in. Absurd.